Adm. Mike Mullen, chairman of the Joint Chiefs of Staff, expressed outrage to his combatant commanders after seeing some of the detainee abuse photos now under wraps by the Obama administration. In a memo, Mullen says he is "appalled by even the suggestion that someone in an American uniform would behave in such a way." The photos depict clear instances of abuse -- though not torture -- that included beatings and in some cases deaths during battlefield detentions in Iraq from 2001-2006. Adm. Mullen is the first top military commander to admit that what were in those photos included what would be described as "abuse." President Obama ordered the photos not be released after commanders argued that their release could jeopardize the lives of American soldiers serving in Iraq and elsewhere. Unlike the now infamous photos from Abu Ghraib prison, all these photos were taken during battlefield interrogations before imprisonment. In the memo, Mullen demands his forces be trained so they understand this kind of thing should never happen again. "We haven't all absorbed or applied all the lessons of Abu Ghraib," he wrote. Mullen does not think the photos should be released and agrees such a move would inflame the situation. However, his memo was a shot across the bow to commanders that they need to do more to prevent any abuses of those captured on the battlefield and to prepare troops to handle detainees better and according to the Army Field Manual. 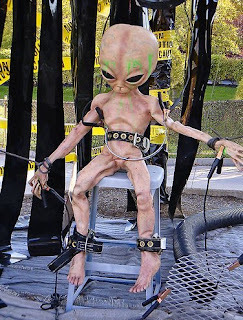 Colonel "Whopper" Creedon of UNETIDA spoke today of how he brought reform to the detention policies of Extra Terrestrials interdicted by his organisation. "I can't say we treated the Greys we caught earlier than the Abu Ghraib disclosure better then the poor souls in those photos, but I think we did get a wake up call when we saw how the majority of the public were outraged, both in the US and the international community," he said. "Upon an investigation that I was asked to conduct on behalf of the UN Security Council, I discovered some practices that I'd have to diplomatically refer to as "unsound". It all came to an abrupt end in true Japanese fashion when Colonel "Shinobi" Kishimoto, Commander of UNETIDA's Detention Division accepted full responsibility and committed seppuku. [Such a pity that people like Janis Karpinski don't do the same, it would save some serious time and money]," muttered Creedon. "Don't get me wrong, we not gone all soft of them either," assured the Colonel. "We don't feed the Melmacian's kittens or other cute animals for example. And we do use some pretty foul language and harsh cutting insults. I'm confident that those tactics will also work on the hardened extreme Jihadists who want to kill us all." I'm glad that Mullen is so clearheaded about this. Demanding that our troops act with honor is nothing more than common sense. The further unfortunate thing I read is that women in service are more likely to be raped than injured in pursuit of their national duty. By American military men. And the only branch that seems to be stepping up against that is the Marines. Yes, I think more of a bludgeoning than any actual cutting is more along the lines of what we're looking at here. Also, my word verification is "booze"